When she made me laugh right in the middle of a full-on breakdown, sending salty snot flying from my nose, I knew my sister was my hero. The first time I saw her perform standup, it left me not just laughing but gaping in awe of her ability to hurtle a crowd into fits of laughter. So, with her 3,000 miles away, I often use her clips on her website and YouTube to remind me that laughing has a way of turning pain into light so that it becomes far away, and transparent. On our summer visit in Los Angeles, that light shown even more brightly. On the night we ventured out to watch Man of Steel, it become apparent that she owned the title Woman of Steel and that her superpower is laughter. It was her birthday and she chose it thinking that she would entertain my children and still see a great movie. 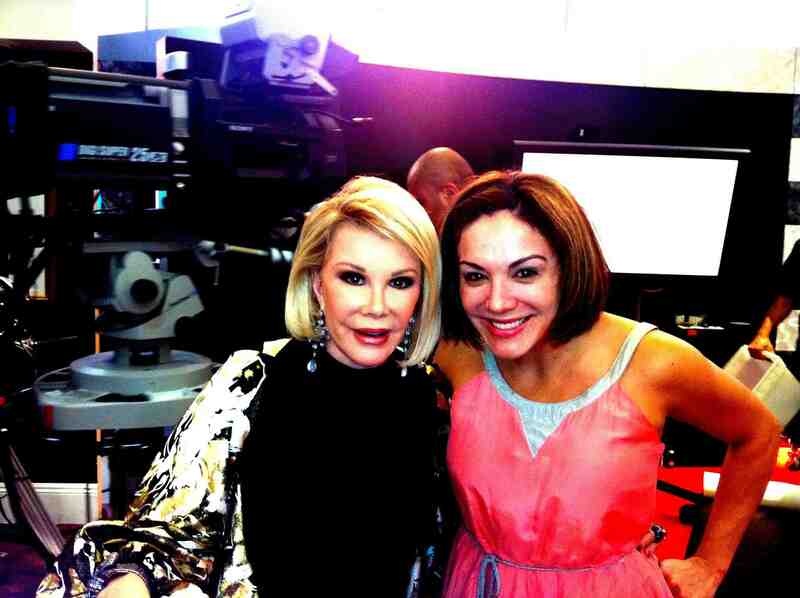 Jill with Joan on set of Fashion Police. After watching Man of Steel, I walked out feeling the same way I normally feel when I leave a much-anticipated film or even television series that I’m disappointed with. I felt disoriented and unappreciated. I felt like Hollywood could care less about what our daughters and sons learn and they definitely underestimate their ability to interpret anything more than cheap lines and renditions of X-Box or PlayStation games. Then my sister laughed and laughed again. “What was that? My brain hurts,” she blurted. She asked the kids what they thought and they shrugged and displayed that slanted twist of their mouths, their eyebrows raised. Then it happened. Superhero Woman of Steel mode kicked in and POW! She riddled us with joke after joke, which I can’t remember because it comes at you so fast, this blur of laughter hitting you then wrapping around you so tightly that the only thing you can do is double over in fits of laughter. She always does this, well, at least most of the time. She, my sister and comedian Jill Michele Melean, always forces us to laugh at the absurd and even more so the depressing. Sometimes, I’d get angry and even sometimes cry harder, but she’d wake me out of my coma and laughter always followed. As kids, if I was sad, which was often enough, she’d come running over ready to make faces and throw a nice smelly fart my way. She was completely and utterly inappropriate and I thank the heavens for beaming her to down to me. So, this is for you. For those times when happiness seems too far away, Jill Michele brings us laughter, the perfect weapon. I don’t know what I’d do without her. They are. It’s interesting how they sometimes do anything just to see you smile. I can’t imagine a day without laughter in it and how great to share a lifetime with a sister who makes you laugh like yours does. So wonderful. It is a lifetime! You’re right. And, what a great one because she was there. I can’t either and I really think it’s because of her. Childhood was rough, but she made it ironically fantastic. I love this post! I see a similar relationship in my children. My daughter is the more serious one who tends to over analyze and worry. My son is the only one who knows just what to say or do to make her laugh at just the right moment. Thank you you for sharing. I could tell from the pictures. It’s actually the same in my house. My son’s the comedian. What’s really weird is that I looked a lot like your daughter when I was younger.